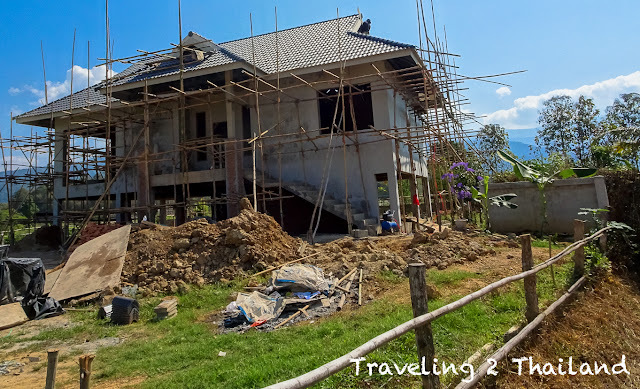 As part of Living in Thailand, the Rice Field Project follows our journey of buying land, preparing it for building our house and finally building our house. This is part 33, to read the other parts click The Rice Field Project. We bought the land in September & November 2017. The construction of the house started 29 October 2018. The past 3 months the cement crew has been working at our to become house. That is now declared finished and they will go to a new project. Although I am sure we will see them back again as there are some things that still have to be done with cement, but that can only be done after all water-pipes are installed. So now it is time for new crews to arrives for installing the water & electric, installing the ceiling, painting the house, installing the floor tiles and many more things. This will all be different working crews, sub-contractors. Following is a small update & photos. Another crew started with construction of all water-pipes and making holes in the floor for water-pipes. 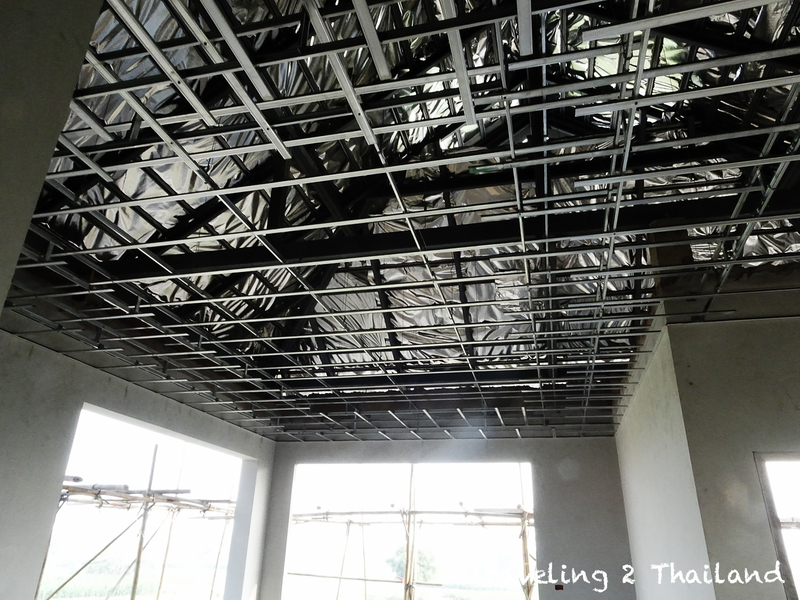 Aluminium frame for the ceiling is installed, the ceiling itself will be done next week. Preparations under the house have been made to pour in the floor under the house. In the meanwhile some first quality checks have been done and the plaster work on some beam parts is removed and will be done again. And in the meanwhile we have been looking for a build-in kitchen at Home Pro in Phrae ..... costs 128.000 Thai baht! That is only 5 metre counter, without utilities in it. So we had also a look at a shop in Nan town and that is only 70.000 Thai baht. So we will order it from that shop. And while at Home Pro in Phrae we did also order all our bathroom & toilet utilities. Why in Phrae? Because Global House in Nan is charging the standard price for all materials. Actually the construction company is ordering it and gets also discount. We started with a house of 1.x MB but made the house higher and a little bit bigger so the houses became almost 100.000 Thai bath more expensive. 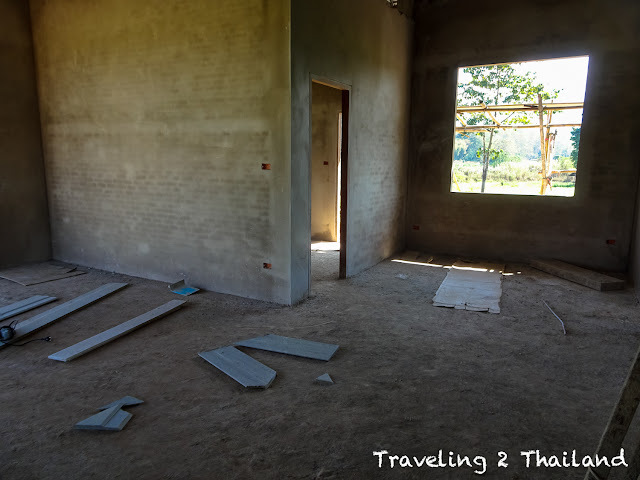 Then we decided that we need a storage room and toilet under the house for another 70.000 Thai baht extra. We wanted nice teak wooden doors, an extra of 30.000 Thai baht. And we will have to buy water filter systems, water tank and water pumps. Expected to costs about 30.000 Thai baht.